What's up Guys we're going to be looking at the key differences between the iPhone X and Samsung Galaxy S9+.Why we're comparing these two devices? Well, they are the best that their manufacturers have to offer.We've got the best from Apple and the best from Samsung.Starting off with the size, the S9+ is larger compared to the iPhone X.Around 14.5 millimeters in terms of the height.2.9 millimeters in terms of the width.And it's also 0.8 millimeters thicker.It weighs around about 15 grams more and this is all because it does have a larger display.We've got a 6.2-inch display on the S9+.On the iPhone X, we've got a 5.8-inch display. Now we've got all our technology on both of these displays.On the S9+, it is Super AMOLED and on the iPhone X, they're calling it a Super Retina Display.Now technical aspects aside, both of these are absolutely beautiful and they've got deep blacks and very vibrant colors.Some of the best displays out there.I know some people are going to joke that Samsung has made the display for the iPhone X.Anyway, and yes, that is the case, but it's a great display.And I'm glad that Apple did go with all their technology rather than L.C.D. as they've done for their previous devices.Now the great thing about both devices is that they have minimal bezels.With the S9+, we've actually got smaller bezels compared to S8 pluses last year. And with the iPhone X, we do have small bezels.We had that notch, I know some people don't like it.Personally, I don't mind it too much.We've got very high resolutions on both displays as well.However, the S9+ does have a higher pixel density.How it's not a huge deal, but it is going to be slightly sharper.Now moving on to the build and design.With the iPhone X, you've got a metal frame with glass panels on the front and back.Looks and feel very premium.With the S9+, it looks very similar to last year's S8+ and that is again with the metal frame and curved glass panels on the front and back. Now obviously, the design is subjective and it's going to come down to your personal preference.I do think that the curved glass looks very, very nice.For some people though, they feel that you can't get a screen protector on there easily and they prefer a flat display.The iPhone X is only available in two colors.There's black and there's silver.With the Samsung Galaxy S9+, it is going to be available in four colors and it's going to depend on your market.Both devices are also water and dust resistant which is great.We've got an I.P.68 rating on the S9+. On the iPhone X, we've got I.P.67so slight edge does go to the S9+.Now moving on to the internals.The iPhone X has the A11 Bionic chip which is super fast.The S9+, on the other hand, comes with the Qualcomm Snapdragon 845 or Exynos 9810both of which are very, very fast chips.In terms of RAM, we've got double the amount of RAM on the S9+.Six gigabytes of RAM compared to three on the iPhone X. Now this should help in terms of multi-tasking.On my previous speed test that I did do with the iPhone Xand the Samsung Galaxy Note8.Although the iPhone X was fasterin loading up lots of the apps and games, It didn't manage to keep as many apps openas the Note8 with six gigabytes of RAM.So this might be also the case with the S9+.We will do some speed test side by side to see which one of these is faster.Make sure you subscribe to see that first. Now the speed and performance are also going to come down to the operating systems and how well optimized they are.And we have iOS 11 on the iPhone X.And the S9+, we have Android Oreo with the Samsung Experience guarantee.I've said this before but in terms of which operating system is better, it does come down to your personal preference.Both have their advantages and disadvantages. Looking at storage, the iPhone X comes in two options either 64 gigabytes or 256 gigabytes.You cannot expand this however.With the S9+, it definitely gets the advantage in this category with 128 gigabytes as a base.And that can be expanded via the microSD card slot and you can get a microSD card of up to 400 gigabytes.Now let's take a look at the cameras.With the iPhone X, we've got a dual camera set up.There is one wide angle with an F 1.7 aperture and then there is a telephoto camera with an F 2.4 aperture which is going to give you two times optical zoom. which is going to let you toggle through some different effects after the fact.In my experience, this hasn't worked too well especially when it comes to studio lighting.Now with the S9+ camera, we've got some major changes.Samsung is saying this is the camera re-imagined.We've got dual 12 megapixel cameras.Both optically stabilized.And there is a similar set up where we've got a wide angle as well as a telephoto.The telephoto also has a F 2.4 aperture, but the interesting thing is the wide-angle camera actually has a dual aperture lens. You've got F 1.5 which is the widest aperture on any smart phone right now.It's going to let in a bunch of light and this lets in 28% more light compared to the S8 last year.And then we've got F 2.4.Now, this is actually a mechanical change between the two and you can physically see it on the camera if you look closely.And the way this works is that if the camera notices that you have over 100 lux of light, then it's going to use F 2.4 to give you more focused your shot and give you generally better image in good light. And then when you're below 100 lux, then it's going to use the F 1.5 aperture to give you a much brighter image.Now obviously, we're going to be doing some SuperSaf star-camera comparisons between these two as soon as the S9+ retail version is out.And I cannot wait to test this out especially when it comes to low light.The S9+ also comes with a portrait mode of its own and it's called Live Focus and this is going to give you blurry background in your shots.The good thing with the S9+ is that you can actually edit the amount of blur that you want after the fact.And it also takes two shots. One from the telephoto camera as well as the wide camera.So you do have that wide angle shot as well if needed.Now when it comes to video, the iPhone Xhas four K at 60 frames a second.One of the first smart phone cameras to have this framerate and it's great, definitely one of the best video cameras on a smart phone out right now. we had with Sony last year, but the problem with the Sony cameras last year was that you have to tap it at the exact point.And more often than not, I found myself missing that moment.With the S9+, you do have automatic motion detection.And you can set a square where you want it to detect the motion. When it does detect motion, it's going to start recording.It's much easier to actually get that slow motion shot.I've only had a brief play around this, but it does seem to work really, really well. with an F 2.2 aperture.Also has a portrait mode as well as portrait lighting from the front facing camera.In my experience, it hasn't worked so great.Maybe because I have a beard, it does seem to kind of struggle with the sides.And this is improving with time, but at this point in time, it's not too great.With the S9+, you've got an eight-megapixel front facing camera with auto-focus and an F 1.7 aperture.It also has a selfie portrait mode.Some people are calling this selfie focus. Once again, this is going to blur the background from your front-facing shots.This works best in my experience so far, on the Pixel 2, soit'll be interesting to see how well the S9+ performs.Now moving onto the audio, as you guys know with the iPhone X, we no longer have a headphone jack.This was the case as well with the iPhone 7s.But the good thing is that we do have serious speakers on the iPhone X.
as Face I.D. on the iPhone X, you do have something called Intelligence Scan.And this is where it's going to use the iris scanner as well as facial recognition in combination to give you more security.So it is nice to have multiple options to unlock on the S9+.With the iPhone X, I've said this before, but in addition to Face I.D., it would've been nice to have a fingerprint scan on Apple logo on the back.I just think certain situations where Face I.D.isnot ideal when your face is half sunken in the pillow and something like that.And in situations like that, Touch I.D.on the back, in addition, would've been nice.For the A.I. assistance, we've got Siri on the iPhone Xand we've got Bixby on the S9+. Now Bixby does have some new features with the S9+and some of them are on Bixby Vision.There's live translate which is going to let you point your camera at say, a menu or something and it's going to translate that for you live there and then on your screen.And there's also some more features such as pointing your camera at food and then it's going to give you information, such as how many calories there are.Now the iPhone X introduced Animojis. These are basically animated emojis and the way it works is it uses the front-facing camera as well as some sensors to see your facial expressions and it repeats those on the emoji that you have on your phone, or Animojis that you have in your phone.And you've got a variety of things like dogs, chickens, as well as poo.Now this was fun to start with, but for me, the novelty wore off quite quickly.Now Samsung has an answer to Animojisand they are calling it A.R. Emoji. And the way these works is you actually have a 3D character which is supposed to look like you.Uses your image to build this character and then you can edit that character too.And it's going to look at hundred features on your face to give really sick expressions to this A.R. Emoji.I did a quick test of this.It didn't actually look much like me, but I guess I have to spend some more time with it.ow, personally speaking, I think as with Animoji, this is something that I'd probably use for a bit and then just forget about later on.I don't know, this might be something that you enjoy. Now moving onto the batteries.The iPhone has 2,716 M.A.H. battery.This is non-removable and it's actually been pretty good in my usage.With the S9+, you have a larger 3,500 M.A.H. battery and we'll see how well this performs in day to day usage.Now both devices sport wireless charging though you do have fast wireless charging on the S9+. And both devices also fast wireless charging.The advantage that you have on the S9+is that you get the fast charger out of the box, you don't have to buy it separately.With the iPhone X, you only get a standard chargerout of the box and if you do want fast charging,then here in the U.K. it costs around about 75 pounds and yes, that's in addition to the 1,000 pounds that you're going to be spending on the iPhoneand that is the starting price for the 64 gigabyte version.I've said this in my full review of the iPhone X, that to me this is still over priced even though I really like the iPhone X.I do think the price should be lower. The S9+ does come in at a lower price and that is for a larger storage version, 128 gigabytes.So the price advantage definitely goes to the S9+ here.The iPhone X is available right now.With the S9+, you can pre-order it right now and availability is going to be from the 16th of March.Although, if you do pre-order early, then you should be getting your device about a week earlier.So there you have it guys.The Samsung Galaxy S9+ versus the iPhone X. 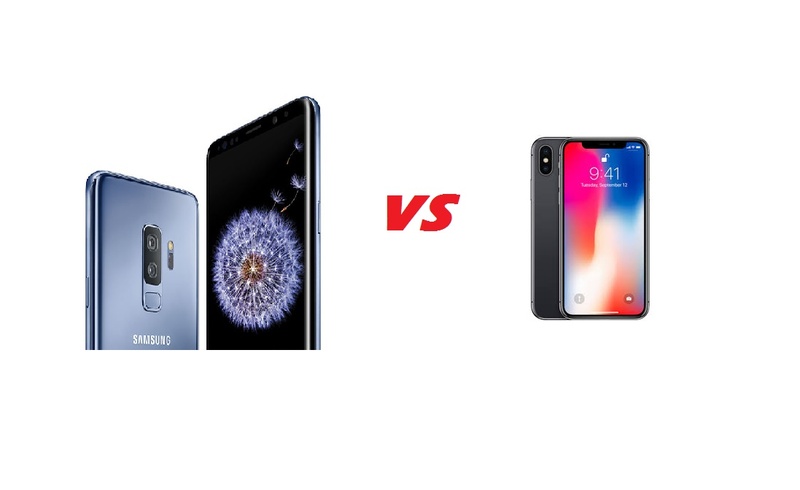 These are the best of the best from Samsung and Apple right now.And I know some of you guys are going to be saying that why didn't I compare iPhone X to the S9, the regular S9.And that is because the regular S9doesdodon't have the additional feature that the S9+ offers such as the dual cameras which makes it more comparable to the iPhone X.What do you guys think of these devices?Which one would be your pick?Definitely drop me a comment below and let me know. I hope you enjoyed this video and it helped you see the key differences between these devices.If it did help you, then please do hit that thumbs up button for me.It really does help me out.And if you haven't already, then be sure to subscribe switch on notifications.We've got lots more quality content coming upon this channel, including lots of comparisons.SuperSaf style.As soon as we have the S9+, we told you we didn't have.Thanks for watching, this is Saf SuperSaf TVand I'll see you next time.